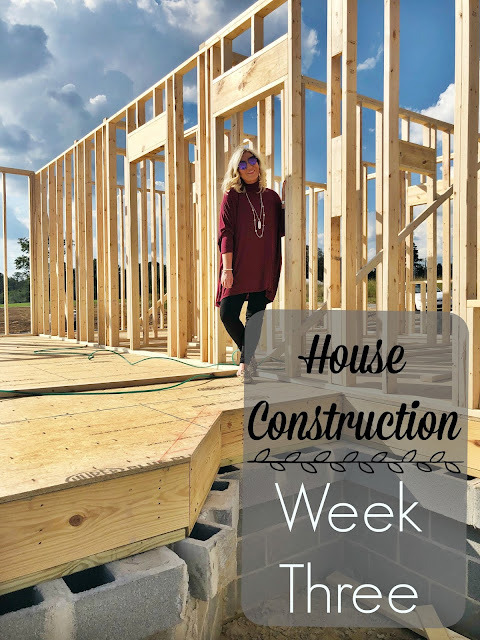 Week 3 of house construction is officially in the books and tons of progress has been made. I tell ya, if they could keep at this pace, I'd be moved in by Thanksgiving! Sadly I know this is the fast part and once the house is dried in everything will slow down. I'm loving this speed though! Here's how the third week of my first house construction project went! At the beginning of the week, they were ready to start laying brick. As soon as I went to the house Monday night, I was immediately worried. The brick didn't look anything like what it was suppose to. I noticed that the brick looked different when it was delivered, but I checked the name and it was what I had picked out. I even when and talked to the two brick layers and told them I was worried and they made me a little sample and assured me it would look differently when it was actually on the house. When I got to the house on Monday, this was what the brick looked like compared to what the sample that I picked out looked like. I sent this to the contractor and he agreed that it didn't look anything like what I had picked out. He talked to the guy from the brick place and discussed the mortar color. The guy assured us that the mortar was the correct color and that it would turn a lighter shade within 3 days and once it cured in 3 weeks, it would be completely white. The contractor sent me pics of the mortar after they dried out a little place with heat lamps and blow dryers. I can safely say it looks completely different now. If you're worried about your brick/mortar color, give it time and it will look different! Now onto exterior colors. I've always wanted a gray house, but I'm not entirely sure if I want dark gray or light gray. I'm leaning towards dark, but feel free to give me your opinions! On Sunday, I visited a section of Lowes that I had never set foot in: the water line section. ;) My sweet-84 year old- Pawpaw was determined to run my water line to my house and he did just that, along with the help of my 82 year old grandmother. Is that not just amazing, y'all?? I'm so thankful they are still able to do this! And then there were WALLS! This made SUCH a huge change in the feel of the house. You could actually see rooms now. I had to make a decision about the number of windows in my bedroom and I asked y'all on Instagram what you thought. The majority said keep all 4 or take away the back porch window. I decided to keep all 4 because I love all the natural light. It will make furniture placement a little harder, but I'm so happy with that decision! Half of the house is framed! Now it's ready for week 4 so we can framed the rest!